Surprise, surprise! A lovely Saturday post for you on this dreary and rainy day. As I sit at home in- as I like to call it, the triple S- sweatpants, sweatshirts, and socks, I'd thought it was time to talk internet housekeeping of sales, pages, and such. Plus, what's better way than a fun alphabet game? That is what I thought. F: I'm back on the book of face, er, I mean Facebook! Be sure to like my page for exclusive sneak peeks of upcoming posts, shopping scores, and anything else my little brain desires to share. S: Fellow sneaker heads rejoice! Because these sick kicks on Shopbop will make you go weak at the knees. T: If you follow along on Twitter, you'd see that the cunning trickster, Tumblr has sucked me into their cyberhole once again, so come to the dark side with me... plus, you can ask me endless questions about absolutely anything. Well, nice chat if I don't say so myself. Later gators. i'm absolutely in love with this outfit! The cardigan is so cute. 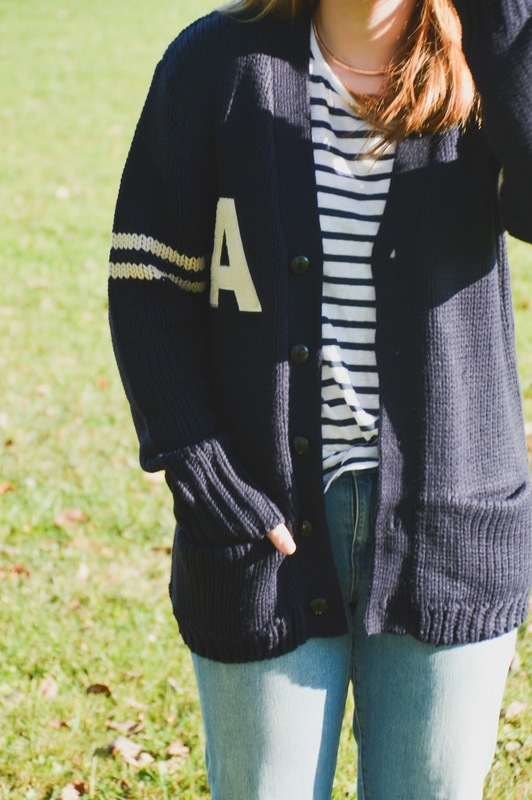 Love your sweater, so perfect for the fall! I just got back on Tumblr..and oh my gosh I forgot how addicting it is. Hope you have a wonderful weekend!